CINCINNATI – Standing spellbound, the crowd of students, parents, alumni and teachers choked back tears as they watched their beloved, historic school go up in flames. 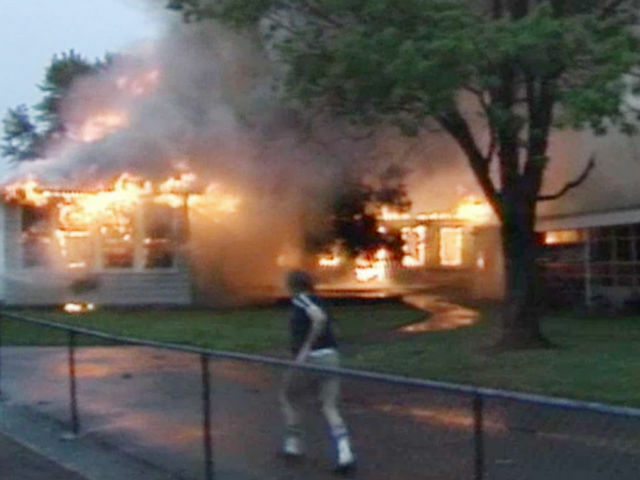 The spectacular fire at the Lotspeich School in Madisonville - part of The Seven Hills School - caused $3.5 million in damage and destroyed a 55-year-old wood-framed building that housed the treasured library, elementary school classrooms, the science and computer lab and offices on the night of July 6, 1987. The headmaster, Peter Briggs, said custodians told him lightning had hit the building. Briggs told WCPO he left his office just minutes before the fire broke out - shortly before 8 p.m.
"We were having a terrible lightning storm and we lost the power in our computers and our lights and my fan in my office, so it's conceivable, indeed likely, that that's what happened," Briggs said. Fire officials confirmed that the next day, saying that lightning hit the cupola dome on the wooden roof and ignited the blaze. "When I got here, there were flames 60 to 80 feet high," said District 5 Fire Chief Terry Folzenlogen. Flames could be seen a mile away. It took three hours to bring the fire under control. It was the same building the school's founder, the noted Helen Lotspeich, built in 1930 and where she visited and spoke to students decades later. As they stood nearby and watched helplessly, onlookers hugged and consoled each other, and many shared memories from childhoods spent there. "It's really sad," a young woman told WCPO. "I remember the times I walked through the halls … It's really something to see it burn." "I met all my friends in the world at this school," a young man said. "This is where I learned from Mr. (Russ) Davisson how strong lightning is," Lisa Binkley told a Cincinnati Post reporter as she stood in front of the rubble that used to be the science room. "Now I'm learning it again." "This school is very tight," Bob Deubell told the Post. His wife worked at the school and his daughter had just graduated. "My wife loves the school. It's more than just a job. To watch all the teachers show up and stand there with tears in their eyes is very hard." The building nearly burned to the ground. Only one wall remained. Firefighters took defensive positions and protected other concrete buildings on the campus, which also housed the middle school. Several classrooms sustained smoke and water damage. There were only a handful of people there on a summer's night and no one was injured. "I feel especially blessed that no one was hurt," Briggs said. "It's also gratifying to see all the students and teachers here." Some 320 children attended Lotspeich School for kindergarten through sixth grade. School officials said they would set up temporary classrooms and open on schedule Sept. 2 - just two months away. Briggs said the school library was the "most devastating loss." He called it "the physical and spiritual core of the school." He said it contained about 9,400 texts, including many first-edition children's books. Other lost items were irreplaceable. "There was a water fountain in the hallway that Charles Taft gave in memory of his daughter," Briggs said sadly. "There were pictures of 50-year class reunions." Helen Gibbons Lotspeich, an Ivy League graduate who went to Germany to get her master's degree, started her own school in 1916 in her Clifton home with 14 students. She believed fresh air stimulated the mind, and later when she had a framed school building constructed in her backyard, she didn't close the windows. She called it the Clifton Open-Air School. During winter, students wore coats, hats and mittens. Lotspeich, a Quaker, was a progressive educator who emphasized reading and life experiences and taught a full range of subjects, including music, arts and crafts and the Bible. She took students from diverse backgrounds and welcomed Jewish students, even teaching Hebrew. Some of her students came from the city's most prestigious families - Taft, Gamble, Gradison. Donations from those families helped her build the wooden schoolhouse in Madisonville next to another independent school, Hillsdale. Lotspeich School merged with Hillsdale in 1954. In 1974, they merged with the College Preparatory School in East Walnut Hills to form The Seven Hills School. The day after the fire, more people came to view the damage in the daylight. Some teachers were shocked to find so little left of their classrooms. "Yours is totally gone - everything," one teacher said to another as they stood outside the charred beams and books burned to ashes. "I've been at this school for 27 years and I just feel like my second home is gone," another said. But all was not lost. In the days and weeks that followed, the Seven Hills community rallied to get the school ready to open. They carted off debris, cleaned the books and equipment that was spared and donated to a rebuilding fund. "Lotspeich is special. This is a family," one woman said. "This didn't just happen to Lotspeich School. This happened to the Seven Hills family."